Cellist SOPHIE SHAO is rapidly gaining international acclaim for her brilliant, mature interpretations of repertoire ranging from Bach and Beethoven to Crumb and Wilson. Strad Magazine praised her "superior sense of style" and the World News described her "sensitive, stylistic playing, with great finesse, emotion, and gorgeous tone." Winner of top prizes at the 2001 Rostropovich Competition and the XII Tchaikovsky Competition in 2002, Ms. Shao received the prestigious Avery Fisher Career Grant at the age of nineteen. She made her first appearance with the Houston Symphony at the age of eleven, playing Boccherini's Cello Concerto, and has returned to perform with the orchestra on numerous occasions. Other orchestral appearances include the Orchestre de Paris with Christoph Eschenbach, the Russian State Academic Symphony Cappella with Valery Poliansky, Erie Symphony, Yale Symphony, Abilene Philharmonic, Orchestra of the Southern Finger Lakes, the Cayuga Chamber Orchestra, among others. She has performed recitals throughout the United States, Europe, and Asia, and has appeared in performances in such venues as the 92nd Street Y, Carnegie, Avery Fisher, Alice Tully, and Merkin Halls in New York, Suntory Hall in Tokyo, Heinz Hall in Pittsburgh, Ford Centre in Toronto, and Rice University in Houston. In great demand as a chamber musician, she has collaborated with members of the Beaux Arts Trio, the Guarneri, Juilliard, Orion, Cleveland, Mendelssohn String Quartets, and has performed with such distinguished artists as Gary Graffman, David Shifrin, Jaime Laredo, Andre Previn, Eugene Istomin, Cho-Liang Lin, Andre-Michel Schub, Paquito D'Rivera, Andras Schiff, Fred Sherry, Ani Kavafian, Claude Frank, Andre Watts, Martha Argerich, and Christoph Eschenbach. Ms. Shao's many festival appearances include Marlboro, Chamber Music Northwest, Bard, Caramoor, Bridgehampton, Sarasota, Music from Angel Fire, Vail, Saratoga, and Ravinia. In the 1998-1999 and 1999-2000 seasons, Sophie Shao was a member of Chamber Music Society Two, the Chamber Music Society of Lincoln Center's program for emerging young artists, and continues to be a regular guest at the Chamber Music Society. In the 2003-2004 season, she performed frequently with Concertante, an ensemble devoted to playing chamber works of five people or more, and her chamber music collaborations this season takes her throughout the United States and Taiwan. Ms. Shao can be heard on EMI Classics, playing Andre Previn's Reflections with the Curtis Orchestra under the direction of the composer. Her 1995 performance of Mendelssohn's Quartet in a minor appears on Marlboro Music Festival's 50th Anniversary Album on Bridge Records. Just released by Albany Records in July of 2005, "Diablerie" features the music of composer Richard Wilson, performed by Rolfe Schulte, violin, Sophie Shao, cello, Allen Blustine, clarinet, and Richard Wilson, piano. 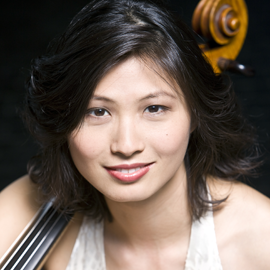 A native of Houston, Texas, Ms. Shao began playing the cello at age six, and was a student of Shirley Trepel, then the principal cellist of the Houston Symphony and professor at Rice University. At age thirteen she enrolled at the Curtis Institute of Music in Philadelphia, studying cello with David Soyer and chamber music with Felix Galimir. After graduating from the Curtis Institute, she continued her cello studies with Aldo Parisot at Yale University, receiving a B.A. in Religious Studies from Yale College and an M.M. from the Yale School of Music, where she was enrolled as a Paul and Daisy Soros Fellow. She now resides in Manhattan, and teaches cello at the Bard College Conservatory of Music, Vassar College, and Princeton University.